It was the spring of 2009. I sat down in my doctor’s office with trembling hands. Ben and I had decided we were ready to become parents. I’d stopped taking the Pill. I wanted to know what I should be doing to prepare my body for pregnancy. My doctor listened to me as I explained my situation. She was silent for a few moments after I’d finished. She thought a little more. It seemed like no one had ever asked that question before. I agreed to it. I was just so relieved she wasn’t requiring a pap smear. She took a vial of blood. I walked out. The next time I visited the grocery store, I picked up a bottle of those hard, pink tablets. A year later, I still wasn’t pregnant. By the grace of God, around that time I stumbled upon Natural Family Planning through my fellow marriage bloggers (I was writing for Project M at the time). I came across Naturally Knocked Up, which introduced me to the world of Nourishing Traditions and the Weston A Price Foundation – an upside-down world where saturated fats were good for you, whole grains were harmful unless soaked, fruits were overrated, and the best foods were alive with bacteria. Through vigorous research, I learned and learned about my body. I got to know my cycles and learned to identify hormone problems just by observing cervical fluid. I discovered whole foods and herbal supplements and ancient wisdom about fertility and food. I was becoming well-steeped in the knowledge of traditional foods when I finally, almost two years after that doctor’s appointment – to my heart’s exuberant joy — became pregnant and carried to term an extraordinarily healthy little girl. Now that that little girl is running and jumping into toddlerhood, and my body is starting to return to its old rhythms, my mind is wandering to thoughts of Baby Number Two. This time, though, I’m in a whole new place. I know how I want to prepare my body for pregnancy. I have no idea whether or not God will bless me with a second pregnancy. If he does, it might take years. His timing is not my timing, I have discovered. * But in the meantime, I want my body to be as ready as possible. I’m taking steps to make sure, in the event of a pregnancy, that my body is well-nourished and ready to support another life. Here’s what I’m doing, and why. Those who knew me when I was writing for Project M will remember all my posts about natural family planning or, as I prefer to call it, fertility awareness. Fertility awareness helped me to identify low progesterone levels, which helped me to pinpoint what kind of supplements I needed to naturally improve my fertility. Now that my cycles have been coming back, post-partum, I’m getting to know my body again — both to help me identify any problems and to help me and Ben to determine when would be the best time to conceive. I will admit, I haven’t been all that vigilant with my observations and charting thus far. I’ve only been casually tracking – mostly because I’m not all that anxious to either conceive or postpone a pregnancy at this point (I’m fine either way), and also because I can tell my cycles aren’t quite back to normal yet. My little girl still nurses a LOT. And I used to rely on my basal body temperature quite a bit to identify my fertility peak, which is pretty much impossible when you co-sleep with a toddler who still wakes up a couple of times at night. But I’m becoming vaguely aware of what’s going on. I’ll get more serious about charting when I get more serious about conceiving. I’ve been doing some research about what supplements to take in preparation for a second pregnancy. Most of my decisions have been based on this post from Wellness Mama (as well as this one about morning sickness). My two main concerns at this point are (a) making sure my baby would have enough of the right nutrients, and (b) preventing morning sickness. A number of articles (Wellness Mama, Mommypotamus, Modern Alternative Mama) suggest that morning sickness may be (among other things) the consequence of a magnesium deficit. Apparently most people are low on magnesium and could benefit from supplementation anyway. It seems that magnesium can be hard to absorb when taken orally, though. (Most of it passes through, which can cause diarrhea). So the best way to absorb magnesium is through your skin. Just yesterday, I got my magnesium in liquid ionic form in the mail, so I can begin adding it to my food as well in tiny amounts (to avoid the whole diarrhea thing), and working up from there. One thing that is supposed to make magnesium easier to absorb is Vitamin D. Which leads me to my next supplement . . .
(b) it sounds disgusting. I didn’t want to sink a bunch of money into something I’d never actually take. But I’ve been SO CURIOUS for SO LONG, and I finally felt there was a little room in our budget, so I ordered a bottle. I’d read it was amazing for boosting your immune system, so I wanted it in the house for the cold and flu season. It helped that I wanted to start prepping my body for pregnancy as well, because I knew that The Weston A. Price Foundation recommends it as a superfood during pregnancy for proper development of baby’s brain, bone structure and more. Fermented cod liver oil is a great source of Vitamins, D & A and Omega-3s, which are all important to a growing baby’s development. And, like I said, Vitamin D is essential for proper absorption and use of magnesium in the body, which I’m also taking. 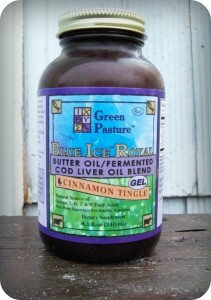 I got the butter oil/cod liver oil blend, in the flavoured gel form — cinnamon tingle. Dr. Price is quoted as having said that high-vitamin butter oil and fermented cod liver oil together “work like magic” to boost your immunity and help improve your overall health. (I got most of my information from here, if you want to read more). So you’re wondering how bad it tastes? Not bad at all! It tastes like slightly funky cinnamon hearts. OK, this post is getting ridiculously long. I’ll just say that I’m still interested in some kind of natural, whole-food multivitamin, in case I’m missing anything. But I feel like I’ve got the essentials nailed. I’m considering this homemade herbal multivitamin tincture. But I might still go with some kind of commercial capsule, if I can find a good one. (Nothing with synthetic vitamin A, though.) Any recommendations? I haven’t even gotten started on diet — how I’m eating lots of healthy fats (mmmmm, butter) and protein, plenty of vegetables, cultured foods, raw milk and homemade bone broth. But I’m not changing anything in my diet — this is the way I always try to eat now. What are your thoughts? Have you done, or are you doing, anything to prepare for pregnancy? Anything you’d like to learn more about? *See the comments for an interesting discussion of whether God blesses us with pregnancies. If you buy anything, I get a teensy commission. haha! Thanks Kathleen =D I have to admit it feels like there should be so much more I should be doing the second time around – except I check my notes and it’s relatively little (get ab muscles back in shape, walking, vitamins, ditch that caffeine habit, etc.) We’re still about 6 months away from switching to TTC, but I’m definitely want to make sure my body is ready (you know in case it doesn’t make me wait 14 months for a positive again). p.s. thanks to this I remembered to this I remember my first OB diagnosed me with a MTHFR deficiency (I don’t absorb folate very well – like barely at all, only 30 – 40%) and that I need to get a hold of that information and start back on those supplements asap! If you have haven’t been tested for MTHFR I’d recommend it – turns out an extreme lack of folate due to this problem can cause a whole slew of pregnancy related problems. I’ve never heard of that! Out of curiosity: what sort of supplements helped with that? Oh yes, I’ve read that, too! this is a great post. my husband and I love NFP and are living in post-baby #2 land, hoping to hold off baby #3 while still trusting my body (which is hard. baby #2 was a surprise on my 3rd ovulation – you are right about BBT and bedsharing with an all-night nurser. although i’m tandem nursing in the night and no ovulation so far, which is very nice). if we decide to try for another baby someday i’ll come back to this post! Can you explain that a bit more? As someone who’s used fertility awareness to become pregnant, do you still ultimately think God “blesses” or “doesn’t bless” someone a baby? In a way, fertility awareness has increased my sense that God blesses us with children. First of all, because I believe pregnancy and babies are blessings, and all good things come from God! There’s more to it, though. The Pill teaches us (somewhat falsely) that WE have control over our fertility, which we can (and ought to) turn on and off like a light switch. Artificial birth control also teaches us that fertility is a bad thing that we ought to switch off. But fertility awareness teaches us that our bodies and our fertility are good things, and just being familiar with them can help us to conceive or delay pregnancy. While I can work with my body to either get pregnant or avoid pregnancy, I discovered that fertility is not something I have complete control over. My body does what it does and I work with that. I can do my best to improve my health and thus my fertility; I can collaborate (ha!) with my husband to time things to increase the odds of conception; but ultimately, God works through my body to bring forth children. It’s in his hands, not mine. Does that make sense? DO you think differently? I appreciate your response and I agree that our fertility isn’t meant to be turned off, and it’s not something we are completely in control of, ever, even when carefully monitoring and appropriately responding to our fertility signs. But I don’t necessarily think that means God is in control of our fertility either. God does work through our bodies to bring forth children, and God amazingly designed our bodies to create and grow and birth babies. I don’t think that means that God is acutely involved each time a sperm and an egg meet, although when they DO meet, I think God’s will is for life to come, for the baby to grow and be born and live a good, long, healthy life experiencing shalom in all relationships. (sadly, God’s will does not always happen). Our bodies are phenomenal, but they are also subject to brokenness, decay and chaos. I think that plays more into infertility or delayed fertility than “God’s timing being different than ours”. But God is so brilliant and so good that God can bring beauty and redemption out of the pain and grief of delayed fertility so that it can seem better that we had to wait. But I don’t think that means God made us wait, just like I don’t think God withholds the “blessing” of a child from a family who never conceives. We have had a very different experience, with three surprise pregnancies in two years of marriage. With each one our bodies have felt out of our own control, but I don’t think that God was micro-managing our fertility better than we could of. My two children living (we lost our first baby early in pregnancy) are incredible gifts and definitely blessings to us but I don’t think “God’s (early!) timing was better than ours,” even though I absolutely LOVE the close age gap and wouldn’t change a thing. I think we took slight risks, are a very fertile combo, and beautiful babies were made. Walter Brueggemann has a quote, I think in his book on the psalms, where he says something like ‘The psalms show us a God who genuinely honours our free choices, but always offers us a future that’s gracious beyond our choosing’. I see that as God’s grace meeting us, not God controlling us. Does that make sense? I think that’s where I come from a bit. I totally get the language of “blessing” and “God’s timing” but I just wonder if it is a good representation of what is really happening between our bodies and God. Goodness, Becca: thanks for the excellent conversation! I have to admit, my saying “God’s timing is different than mine” was a trite oversimplification. It was a sloppy way to acknowledge that I don’t have complete control over my body. At the same time, I wanted to acknowledge the spiritual dimension to birth and life. So I relied on a quick platitude. I appreciate you calling me out on it. My theology aligns with yours much more closely than I expressed. (I subscribe to an open theology, which claims that God doesn’t know the future, and doesn’t micromanage all of creation, although he is present in all things and holds all things together. He honours our free will and the consequences of sin). I still hold that all good things (which include pregnancy and birth) come from God, and so in that way, he “blesses” us with children; but like you, I understand that decay and brokenness are realities that arise out of sin, and that God has chosen to honour those realities. I don’t believe God intentionally “withholds” blessings from anyone, but instead, like you said, works to bring beauty and redemption out of bad things. When I reflect on the torturous two years of infertility I endured before finally conceiving, I have to wonder how exactly God was involved. Was he actively delaying pregnancy, so that I could experience heightened joy and increased wisdom when I finally did have a baby? Or did he grieve with me, not willing it, and finally using my eventual pregnancy for greater good? The Protestant culture in which I live suggests the first; so it’s easy for me to talk that way, and I often do, for simplicity’s sake. But if I delve more deeply into it, I believe the latter is true. Thanks again for engaging me in this topic! Thanks for the thoughtful response. Yes, you are right about miracles – I definitely think sometimes God’s kingdom reign breaks in and circumstances change. i have a good friend with one child who was diagnosed with a severe kidney disease. She was told she could have one more pregnancy before she needed to go on heavy medication; she now has twin girls in her arms. Why do miracles happen sometimes but not always? That’s what I’m wrestling with at the moment. I’d just been reading your blog for awhile now and was surprised by your language and was curious if that’s what you really thought regarding God and fertility. It sounds like we think pretty similarly. Our Protestant culture does use a lot of simple platitudes to explain complex and painful subjects. We need to honour the world’s ambiguity more, even in our everyday language. Thanks again for your response. I think you have a great blog! Ooooh, I’ve never heard about the butter oil and fermented cod liver oil before. It sounds intriguing, and gross. LOL. What about Zinc? It’s supposed to be really good for fertility and the immune system. Otherwise, it sounds like you have things covered. I want to look into those links you posted when I have more time. Is there any food-based way to get magnesium? I’m impressed that you are back to charting, even if only somewhat. I should probably, (FWIW, you can still temp if you co-sleep. Temps won’t be as accurate, but should still be close enough to give you a general idea of things) but I haven’t started charting at all yet. I’m actually really hoping to be blessed with a surprise this time around. We’re not avoiding at all, but not really TTC either and not expecting a pregnancy any time soon. I only started charting after my cycles returned, after 14-ish months, so there’s really nothing to be impressed by. :) I know other women who start charting almost right away, post-partum. Mmmmm, saturated fat! I recently have jumped on that bandwagon and am definitely enjoying butter and whole milk these days. Maybe I’ll have to look into the fermented cod liver oil, but I’m terrible at taking stuff in general, especially if it’s gross or hard to swallow, so we’ll see. Also, interesting about the magnesium. I’m going to do some reading up on that one! I agree that preparing your body for pregnancy is key! And I remember my midwife telling me that almost all key fetal development for a viable pregnancy happens in the first 12 weeks, which is often before some people really know they are pregnant. I have to say I am a little skeptical about the morning sickness remedy. Perhaps this is something that works for people with mild morning sickness, but not severe? I am a first time mom, but was hospitalized several times early on (my body would not even keep down water), and was very sick throughout the entire pregnancy. I guess it just felt like my body/hormones were doing their thing, and it was impossible to find a remedy (wether natural or prescription). My mom was also very sick and lost a lot of weight with all of her pregnancies. I just think genetics are involved more than we realize on this issue. The magnesium thing is less a “remedy” than a “preventative measure” — I think it helps more if you start before you get pregnant, and is less helpful if you’re already pregnant and suffering from morning sickness. I don’t know if it really works, but I’m willing to try! (From what I’ve read, progesterone blocks the absorption of magnesium, so if you’re already pregnant and flooded with progesterone, supplements won’t be able to do much). I think genetics probably play a huge role, too. I’m so sorry to hear about your dreadful experience! Couldn’t keep water down?! Ugh, that sounds absolutely horrible! These are some great tips for women wanting to be healthier even if they aren’t trying to conceive! And that is a beautiful picture! Bekah recently posted..Parenting humbles me. I have the exact same FCLO/butter blend as you, and I agree it wasn’t terrible at all! I just take it with my breakfast and it’s fine. Thanks for the suggestions, Elizabeth! You’re the second person to recommend the Vitamin Code Raw Prenatal (another blogger said it helped ease her morning sickness), so that’s definitely one I’m going to look at more seriously. And the urinalysis sounds like a weird but good idea. We’re not TTC just yet, but I’ve started prepping my body and I also chose Vitamin Code. So far I really like them. It’s three-a-day, so they’re not huge honkin’ horse pills and you can spread out taking them over the course of a day so your body actually gets a chance to absorb what it needs. I’ve also noticed that my pee is not the neon yellow that often comes with multi’s, even when I forget and end up taking them all at once, which I’m chalking up to it being a more absorbable, whole-foods based supplement. Additionally, even when I take them on a fairly empty stomach I don’t feel sick, which is not true of other vitamins I’ve tried in the past. I get mine on amazon.com. I don’t know if they offer subscribe-and-save to our northern brethren, but signing up for that has been the most economical option I’ve found for this brand. Love this post, and really appreciated the comment in the discussions above about whether children are a “blessing”. Good luck prepping for #2! I’m currently 31 weeks pregnant with the second kiddo. For the first one we went all out: I had been eating a 100% paleo diet for 6 months prior, had completely detoxed all chemicals from my diet, beauty and household products, had been taking a high-quality prenatal for years, etc. Had a wonderful pregnancy, slightly eventful labor and birth, and now have a very healthy 2.5 year old daughter. For round two, I started adding more homemade fermented foods and FCLO as well as doing a compromise between WAPF and Paleo. I got pregnant immediately, but this pregnancy has been nothing short of a complete 180 from last time. I’ve had food poisoning (in the ER twice for it), stomach flu, and a severe upper-respiratory infection. It’s really mind-boggling to me as to why my immune system is apparently so much more suppressed this time compared to last. Less sleep? More stress? Hard to say. My whole point, however, is that I lived on the holy altar (slight sarcasm, fellow Christian here) of perfect diet and supplementation. And guess what? I’m still struggling. You can do everything “perfectly” but sometimes these things are out of our hands. I have 9 weeks left and I’m trying to 1)give myself grace (and not beat myself up) and 2)accept that God has a plan. I hope you find peace and joy as you prepare for a second baby. I’ve really enjoyed reading your blog! Thanks for this, Kate. It’s a good reminder. We can never be completely in control of everything, so there will always be surprises. And congrats on the second pregnancy! We take a multivitamin by Standard Process called Catalyn. The contents come from organic food grown in their garden in Wisconsin. Unfortunately you can only get it through healthcare providers. Stay tuned… I am going to be doing a post on whole food supplements versus synthetic vitamins. Sending good vibes your way! Hi, just wondering where you got your info about fermented cod liver oil? I specifically asked my lady doctor (nurse practitioner at a midwife center so she knows quite about alternative stuff) regarding fish oil and pregnancy. She said that fish oil is really good for baby but to stay away from the cod liver oil. do you know anything about that? Some people think large amounts of vitamin A isn’t safe in pregnancy, and cod liver oil is naturally high in vitamin A. It might be that. My research has led me to feel comfortable taking it during pregnancy, but I’m not an expert! Wonderful article! I guess many pregnant women would be able to take care of their health after reading it. 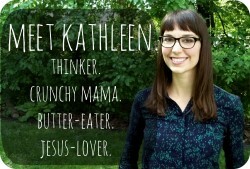 Kathleen, did you hear about Manuka honey, which is produced in New Zealand? It possesses even greater biological activity compared to ordinary honey and contains tons of vitamins and minerals. It is also considered natural antibiotics. Unfortunately, like any honey it can cause allergies, so not everyone can use it.